The Joint Ways and Means Education Subcommittee laid down the rules Friday for Measure 98, the graduation rate-focused ballot measure supported by 66 percent of voters in November. 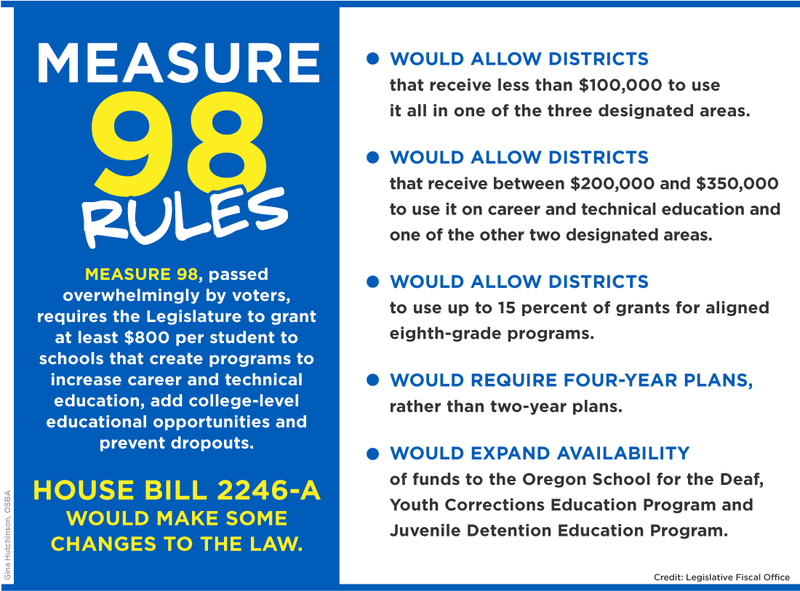 Measure 98 required the state to give districts with acceptable plans $800 per student to “expand and establish” career and technical education, college-level education opportunities and dropout prevention programs. The grants would be appropriated outside the State School Fund. Districts had to use the money for all three areas, and they could not use the money to “maintain” existing programs. Districts, particularly smaller ones, asked for more flexibility. Small grants would not be enough to either address all three areas or to start a new program from scratch. Schools argued that “expanding” a program might not be possible if all the students who want it are already taking it but that such programs would still benefit from increased investment. The subcommittee sent House Bill 2246-A to the full Ways and Means Committee with a “Do pass” recommendation. It would create the statutory language for Measure 98 and establish the High School Graduation and College and Career Readiness Fund for the grants. Education advocates and legislators wrangled over the language, trying to balance flexibility for how schools can use the money with the intent of voters to focus on specific strategies to improve graduation rates. According to Wimmer, 91 percent of Oregon students are in schools that will get no flexibility under the revised Measure 98 rules. The money for the Measure 98 fund is in the budget for the Oregon Department of Education. Senate Bill 5516 would allocate $170 million for the Measure 98 fund, about 58 percent of the estimated $294 million needed to pay $800 per qualifying student. SB 5516 is in the Ways and Means Committee. Education subcommittee member Sen. Arnie Roblan (D-Coos Bay) pointed out during the Thursday hearing that the funding for Measure 98 nearly matched the difference between the $8.2 billion funding for K-12 education and the $8.4 billion that schools said they needed. Measure 98 was intended as additional funding on top of the State School Fund, but districts have to devote additional staff time for grant applications and then use the money under restrictive guidelines. Many education advocates would have preferred to see that money given to schools to make local decisions about how it can best be applied.